Dell launched a revamped version of its 11-inch Windows 8 tablet Wednesday: The Venue 11 Pro 7000 series, powered by Intel’s new Core M processor (formerly codenamed Broadwell). I laid hands on one during a press briefing a couple weeks back, along with several accessories that can turn this tablet into a productivity workhorse in the office and on the road. Dell was also supposed to announce its 8-inch Venue 8 Pro tablet today, but that cat slipped out of the bag late last week. Oh well, the Venue 11 Pro 7000 Series—prices start at $700—is the more interesting of the two families anyway. 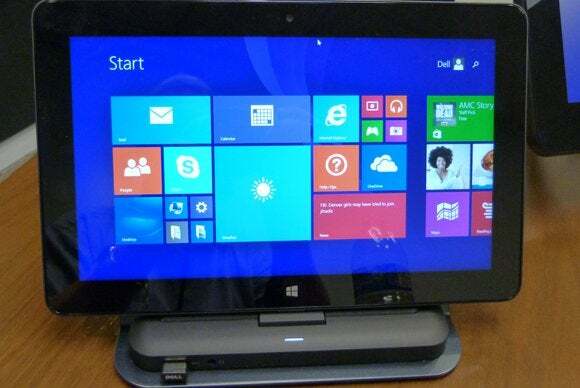 It’s available with either an Intel Core-M 5Y10a processor or the more enterprise-oriented Intel M-5Y70 CPU. Both chips are dual-core models with hyper-threading support and integrated Intel HD Graphics 5300 processors, but the M-5Y70 runs faster (up to 2.6GHz core/850MHz graphics, versus 2.0GHz core/800MHz graphics for the M-5Y10a), and it supports Intel’s vPro technology. vPro is a collection of CPU-level hardware features that add security and IT-management capabilities. An optional dock can transform the Dell Venue 11 Pro into an all-in-one desktop PC. All models in the Venue 11 Pro 7000 series are outfitted with 10.8-inch IPS displays with 1920x1080 resolution and 10-point capacitive touch. The demo unit I played with during the briefing felt much snappier than the Atom-powered—but cheaper—model we reviewed last March. I didn’t have an opportunity to run benchmarks, but I imagine it won’t be as fast as the Core i5 model we tested in August. It also doesn’t have that model’s fingerprint scanner and smart card reader. Venue 11 Pro 7000 series tablets can be ordered with either Windows 8.1 or Windows 8.1 Pro; with 4- or 8GB of LDDR3/1600 memory; and solid-state storage of 64-, 128-, or 256GB. You can augment that storage by plugging a drive into the tablet’s full-size USB 3.0 port. The tablets are equipped with 2-megapixel HD webcams in front, and 8MP cameras in back. A 2x2 Intel Dual Band Wireless-AC 7265 chip provides 802.11ac Wi-Fi connectivity, and there’s support for Bluetooth 4.0 and NFC (near-field communication), too. LTE mobile broadband is available as an added-cost option. The rest of the tablet’s I/O ports include a MicroSD card reader, a micro HDMI output, and a combo mic/headphone jack. The 38Whr lithium-ion battery is charged via a micro USB port. Dell offers three dock options for the Venue 11 Pro series, including a new version of Dell’s Tablet Dock that converts the tablet into an all-in-one PC. It includes a gigabit Ethernet adapter and the ability to drive two displays. The tablet is also compatible with Dell’s older Tablet Dock, which is limited to 10/100 Ethernet. Tablet or clamshell laptop? You get both when you dock Dell's Venue 11 Pro to its optional keyboard. Bonus feature: There's an auxiliary battery in the keyboard. Dell’s mobile keyboard transforms the tablet into a clamshell laptop and includes an internal battery that will double the tablet’s useful life when you’re away from a AC power. If you don’t want to add that much to your carry weight—or spend as much money—Dell’s Tablet keyboard is thinner and lighter, and it retains the ability to prop up the tablet for easy use. The Venue 11 Pro 7000 series should be available for purchase now.